A year ago, Ace Monster Toys member Myles and I did a bunch of work on a DIY Book Scanner based on a variation of Daniel Reetz’s design to make it more lasercutting friendly (see this). We took beta kits of the these to the 2011 Maker Faire and generated a fair amount of interest. 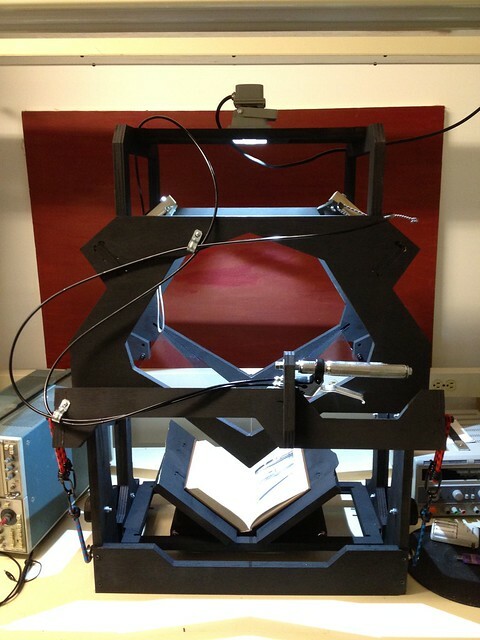 This last fall, Daniel went to the Open Hardware Summit and unveiled a much improved book scanner design. A few weeks after that, he gave us a set of mostly complete parts for the wood framework before moving away. Just a few weeks ago, he announced the near final revision of these. The parts that Daniel gave us kind of languished a bit in preference to other projects but AMT has been very interested in Daniel’s call for a book scanner in every hackerspace. Recently, a new member, Ben, had a pressing need to scan a rare book before returning it so we got a fire lit under us to finally finish the build. As a result of this, Ace Monster Toys now has a fully functioning book scanner in its space. It isn’t the final revision design but it works and works well, using the new bicycle brake design for triggering the cameras, thus bypassing the need for hacked firmware as long as you can lock focus on the cameras after setting it for your books. In the process of doing this work, Mike from AMT, who owns a shopbot, figured out how to do the routing on the current design and we expect to be able to produce more frames from 4’x 8’ sheets of plywood on demand. I’m going to get a couple routed out to do a build of this design. Visitors to AMT can now non-destructively scan books that they own, provided they bring some windex (for cleaning the glass as it gets dusty quickly) and some elbow grease. The next step is to build a light enclosure (pun intended) around it to keep out the horrible UV lights in the space. Think of it as a small black tent for our modest scanner. I want to thank Daniel for all of the work that he’s done on book scanners over the last few years, as well as Ben and Mike for doing work at AMT on the builds. I’ve put a photoset of the AMT book scanner up on flickr as well.